Traditional measures of success for investment dollars fall short of measuring the true impact of environmental improvement. Even the language used in the private sector—as well as government and NGOs—is not appropriate. We’re thinking of a “return on investment” or ROI, but “return” is very inward looking and not a good measure of the investment made in public goods. A better way to consider investment in our natural environment is the “impact” we are having, which is “outward” looking. It might be a simple switch of a few words—“return” versus “impact”—but framing it in that light can change the whole conversation about what the goals of government agencies, NGOs, and the private sector firms might be. The concept of impact investing, where a social and/or environmental impact is generated along with a financial return, is not new and has significantly matured over the last decade. In 2014 alone the outlay in impact investing was at least $10.6 billion. The metrics of “impact” can be tricky, especially for environmental investments. Is it enough to say that we have restored 35 acres of oyster reefs or 200 acres of salt marsh? Does the number of acres protected or restored connote “impact?” Not by a long-shot. Those are outputs but they are not outcomes. A potentially important way to demonstrate the impact of investment in conservation and restoration is capturing the full suite of benefits that are produced and affect human well-being. Frequently when we invest in large public projects, including environmental, metrics of success are the number of jobs that are produced and the income generated. But those benefits, while important, are short-lived. Beginning in 2009, the American Recovery and Reinvestment Act (ARRA) pumped millions of dollars into the U.S. economy to help the country recover from the Great Recession. Coastal restoration projects were a beneficiary of that Act and supported hundreds of jobs. The benefits of these “traditional economic impacts,” represented by the solid blue line in the graph, taper off over time. However, there are additional benefits that are not captured by traditional economic impact analysis. 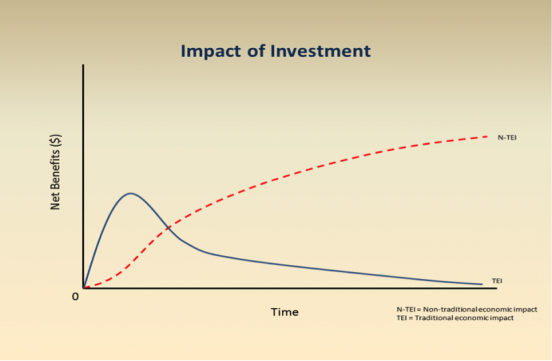 These non-traditional economic impacts or “value added” products, represented by the red dashed line, can potentially generate a greater amount of net-benefit to society. As the investment in the natural capital matures over time (e.g., the salt marsh fills out or the oyster reef grows larger), the delivery of the benefits (which we call ecosystem services) increases. For a salt marsh restoration project this would include the ecosystem services such as storm protection, recreational fishing and hunting opportunities, and water filtration. Now, take this idea of measuring “impact” and apply it to the approximately $14.5 billion that will be spent in the Gulf of Mexico alone for restoration and conservation projects following the Deepwater Horizon oil spill over the next 15–20 years. These projects will cover thousands of acres of various habitats that can bring significant change to the region. But how is that change to be measured and communicated to the public? A number of blog posts in this series have addressed the measurement issue and public goods but not the “so what?” and “why should I care?” questions. Being able to answer those questions, especially for projects funded by public monies, is a critical component to the success of conservation and restoration efforts. Measuring “impact” can go a long way in demonstrating success. Dr. David Yoskowitz is the Associate Director and Endowed Chair for Socio-Economics at the Harte Research Institute, Texas A&M University – Corpus Christi. His work is focused on elucidating the link between environmental well-being and human well-being and moving practice into policy. He recently served as the chief economist of the National Oceanic and Atmospheric Administration (NOAA) where the ideas behind measuring the ‘impact of investment’ were bounced off his colleagues Tracy Rouleau and Jeff Adkins.